I was multi-tasking like a pro. Serving lunch, putting away groceries, folding laundry, chopping up veggies for dinner – wait, what happened in the veggie drawer? The slime! The smell! No problem, for this gal. I rolled up my sleeves, slid another grilled cheese sandwich to the hungry 3-year-old and deftly removed the produce drawers from the fridge. “Mommy will be right back!” I sang as I carted the oozy vessels of soggy cucumbers and dried out broccoli to the compost bin. I went to get the little guy a drink and noticed just how grimy the shelves at the bottom of the fridge were. NO PROBLEM! I carefully lifted them out and left them to soak in the laundry tub. Now to tackle the frames. This was turning into a much bigger project than I had anticipated, but I would not be deterred. By now it was nap time so I could really focus on removing all debris and questionable items from the fridge. I was merciless. An almost empty bottle of ranch dressing – gone! You, too shrimp sauce from 2009. Don’t look at me that way, yeast in a jar, we both know I won’t be baking any bread from scratch. I’m almost done and then I can watch Veronica Mars while I eat some Oreos start organizing photo books. This gross, but weirdly satisfying job was wrapping up nicely – all that was left was to replace the various components. And then, in a flash, my productivity slammed to a halt. As I pulled open the door to return the bins to their sparkling clean home, the entire fridge door came off in my hand. It’s the closest thing I’ve ever had to an out-of-body experience. I stood there, gaping at this big, white door that had acquired magical abilities. Or it was demon-possessed. It’s okay, it’s okay. Let’s just prop it up to keep the cool air in. Then figure out the next step. Have you ever tried to lift a fridge door that is full of jars? Trust me, it’s heavy. I leaned it against one leg and carefully took out all the 179 condiments from its shelves (Pilates, guys, it works). Next, I had to rig something up to keep the cool side cool and the hot side hot. I was very motivated since cheese was on sale and it’s possible I had bought approximately eight bars. Things were looking up. Now it was time to figure out what was going on, so I turned to my good friend, Mr. Google. “Why did my fridge door fall off in my hand?” generates a surprising number of helpful answers. 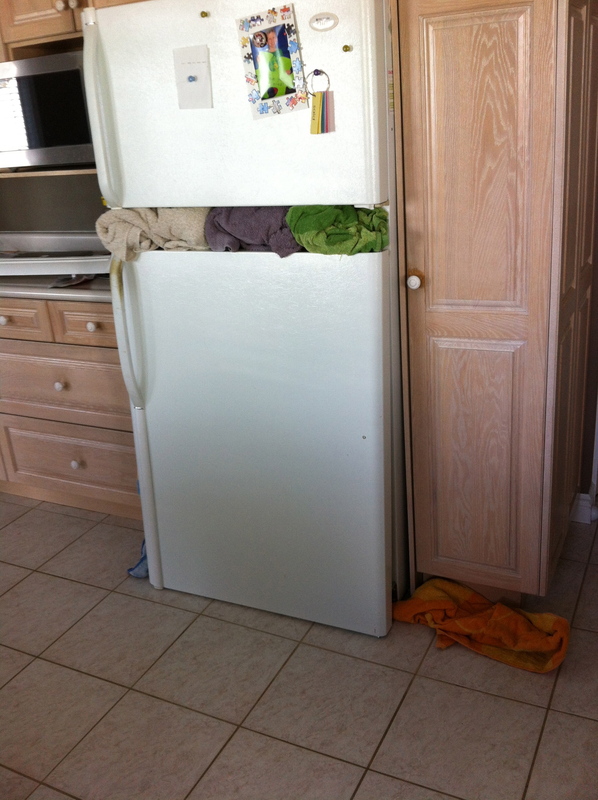 I concluded that none of the necessary procedures could be accomplished by one person, so once the boys were in bed that night, Bearded Husband and I fixed the fridge. It took a couple of attempts, possessed refrigerators doors are very temperamental when it comes to things like “alignment”, but we did it. Note: Never mess with Jan.
Oh no!!! That could have gotten ugly. This just made me think of a ling forgotten story of mine. I had to go home mid day to shower (a patient at work had thrown up on me) and the heavy glass shower door came of the hinge. I had to decide between risking broken glass or calling off help and letting the babysitter see me naked. And I saved both my dignity and the door. It was probably one of those fight or flight reactions that allow women to lift cars off injured children. So heroic. Let’s here it for panic-induced adrenaline! Dropping by from Susie’s party. So, basically, you turned into the Hulk and ripped the door off it’s hinges. Impressive! This reminds me that I need to clean out the science experiements growing in mine. I think it all started from something I ate at a buffet. Thanks for dropping by. This totally cracked me up!!!! What a great story. I’m still laughing! Thanks for bringing it to the Wild Ride blog party! I hope you enjoy meeting my friends by clicking on a few links. It’s still raging over there. Note to self: Must buy aspirin…. I stayed up way too late visiting other blogs – continuing the journey today – love it! Thanks for stopping by. Thanks for the visit and I’m reassured knowing I’m not the only one who blows things up while cooking. Heading over your way. Ha! I completely forgot about that scene. Thanks for visiting – glad you laughed. I feel like the “Jetsons” have really let us down. Thanks, I enjoyed visiting yours, too. Great way to find new blogs. Glad you enjoyed it – thanks for stopping by. Loved this post, still smiling! Will definitely be back. Thanks for visiting. I’ll stop by, too. My phone just started voice control on its own – I don’t think we entirely exorcised the demon.